There are 63 acres of gardens with grand vistas, intimate, secluded areas, a walled kitchen garden, magnificent lakes; the glorious setting is almost beyond description! There have been gardens at Hodnet since the 11th century when the Heber-Percy family constructed their first house in the parkland. Their serious development began in 1921 by the late Brigadier Heber-Percy and today, the 60+ acres are renowned as amongst the finest in the country. Forest trees provide a wonderful backdrop for formal gardens planted to give delight during every season, woodland walks amongst flowering shrubs and a daisy chain of ornamental pools. Hodnet has recently been awarded National Collection Status for Cercidiphyllum. These wonderful trees color beautifully in autumn and give off a powerful aroma of toffee as the leaves fall, hence the common name of "burnt sugar trees". Visitors can explore the gardens, meet top nurserymen and women and enjoy light refreshments in the picturesque restaurant. What more could you want on an early summer's day? Disabled visitors are very welcome : approximately 60 percent of the gardens are accessible to wheelchairs but please note the paths are mainly grass or gravel and therefore more accessible in dry conditions. Restaurant open for lunches & teas. Hooksgreen Herbs from Staffordshire: Flowering and foliage herbs. RHS Gold medallists. 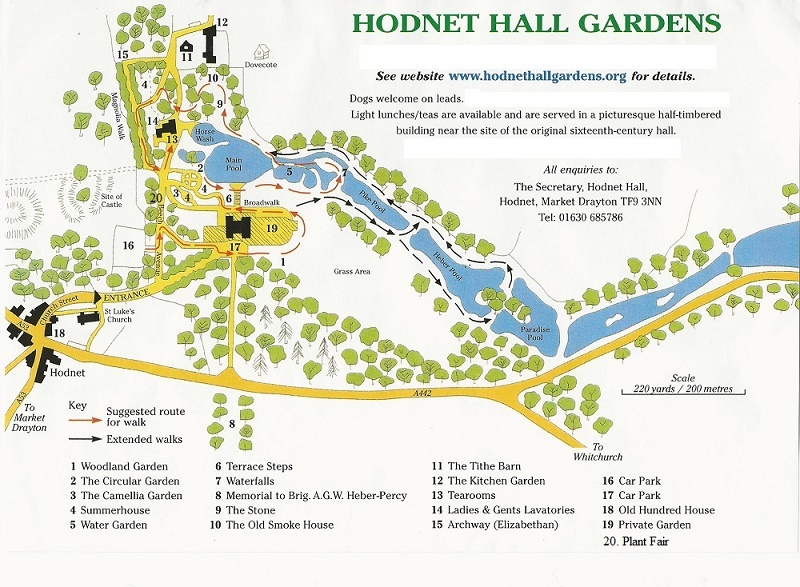 Hodnet Hall is in the village of Hodnet, near Market Drayton, 12 miles north-east of Shrewsbury. Approaching on the A5 road from North Wales, the A53 (Shrewsbury-Market Drayton) road and the A442 (Whitchurch-Wellington) roads, leaving the M6 at exits 12 and 15 or the M54 at exit 3.